Know more about Thermomix and Book your Cooking Experience today to experience the benefits and versatility of Thermomix ® and discover an easier way to cook. 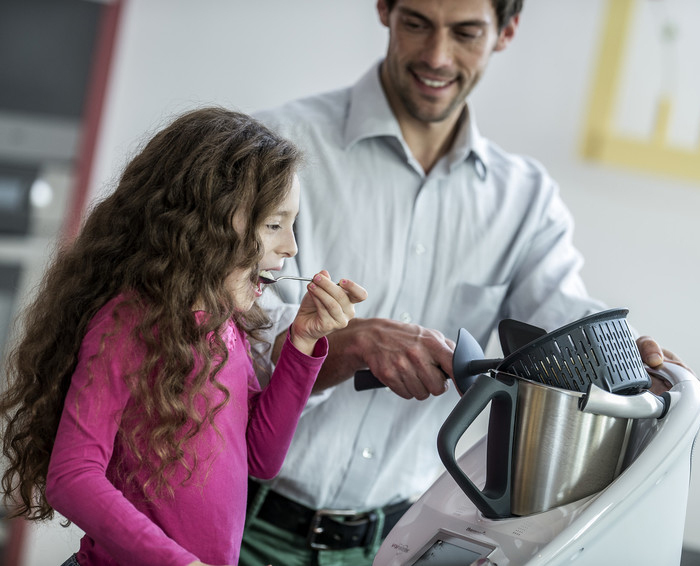 Thermomix ® combines the functions of more than twelve food appliances in one device and can weigh, mix, chop, grind, knead, blend, steam, cook, beat, precisely heat, stir and emulsify. Whether you are preparing daily meals for the family, making yourself an occasional snack or spoiling guests with fancy recipes − with the Thermomix ®, it can all be done in a flash. The spectrum ranges from simply boiling eggs and making salad dressings and dips to pesto, steamed fish, risotto, liqueur or ice cream. No icing sugar or vanilla sugar in the house? Or did someone forget to buy stock cubes? It doesn’t matter because the Thermomix ® can make these things, too! The short answer is that you can cook very quickly and extremely easily. 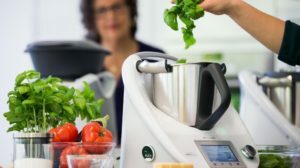 The concept of the Thermomix ® is based on a perfectly complimentary combination of sophisticated, intelligent cooking technology and customised recipes that are tailored to the Thermomix ® to ensure perfect results time after time. You can follow the on screen instructions and quantities or you can refer to the hundreds of recipes online, or in Thermomix ® cookbooks and newsletters, or you can adapt your own favourite recipes. 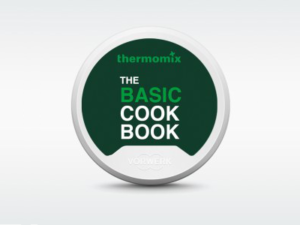 Thermomix ® customers benefit from a unique, comprehensive and diverse selection of recipes. A wide selection can be found in our Thermomix ® cookbooks, on our Recipe Chips and on the Thermomix ® Recipe Platform (due for release 2015). And the best place to start is the Basic Recipe Book with 166 recipes that come with your Thermomix ®! Those who enjoy discussing their cooking experiences and would like to share recipes with others can meet at local cooking classes or contact members of the online fan base via the official community pages or Facebook. Cleaning the Thermomix ® after cooking is very simple. 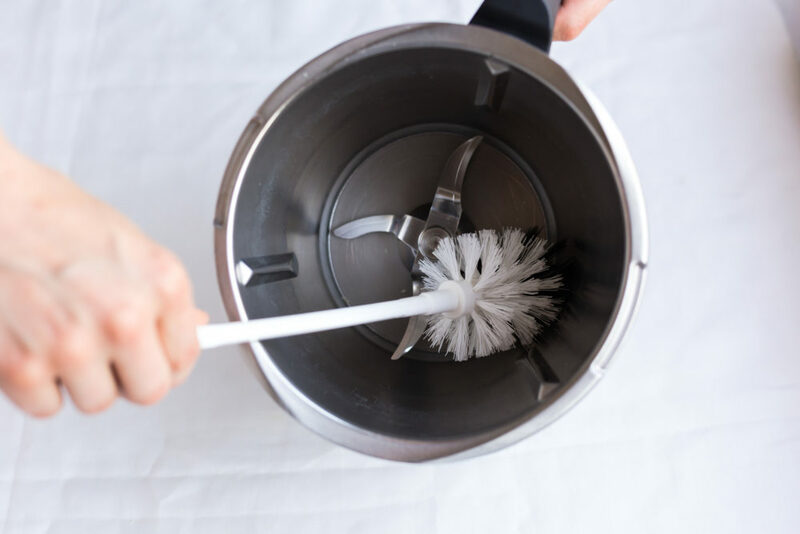 If there is food residue, simply pour a little water and detergent into the bowl and then turn it on at level 10 for a few seconds. This will remove most residue from bowl and lid and if necessary the bowl can be taken apart and placed in the dishwasher or washed by hand as you prefer. All the individual parts of the bowl are dishwasher safe. 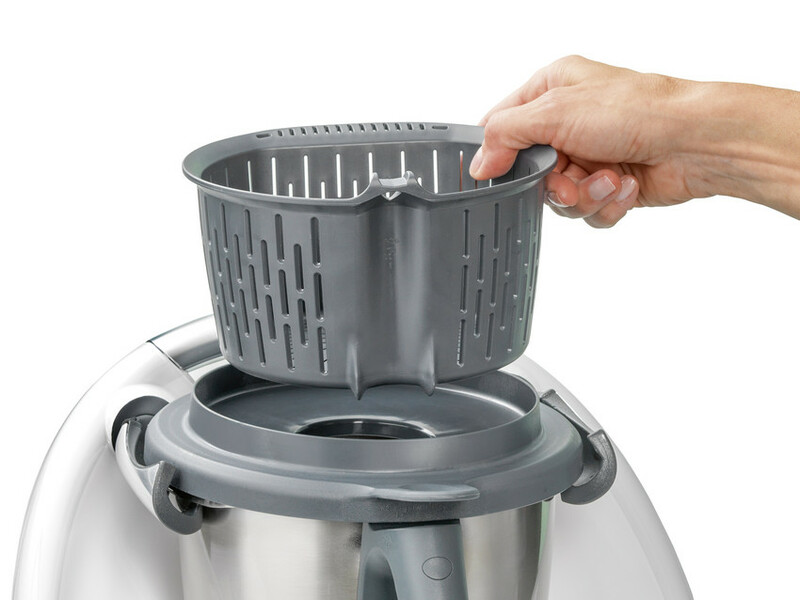 The Thermomix ® itself can be wiped with a damp cloth. 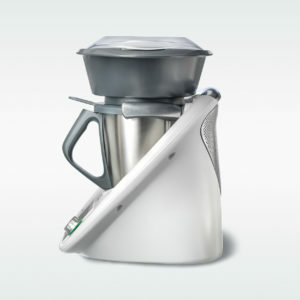 With Thermomix ®, there’s no need to buy a range of different kitchen appliances – this single compact unit does it all. Thermomix ® users around the world experience the savings they make from cooking from scratch every day. Fewer trips to the supermarket, fewer takeaways and more efficient cooking. And they experience restaurant-quality food at home, and meals that are more healthy and nutritious. Customers also receive much more than a technically exceptional product with proven Vorwerk quality with their purchase. Aside from the security of knowing that they have the ultimate multi-functional food processor, the service, support and recipe community offered in conjunction with it also add great value to this complete cooking solution. 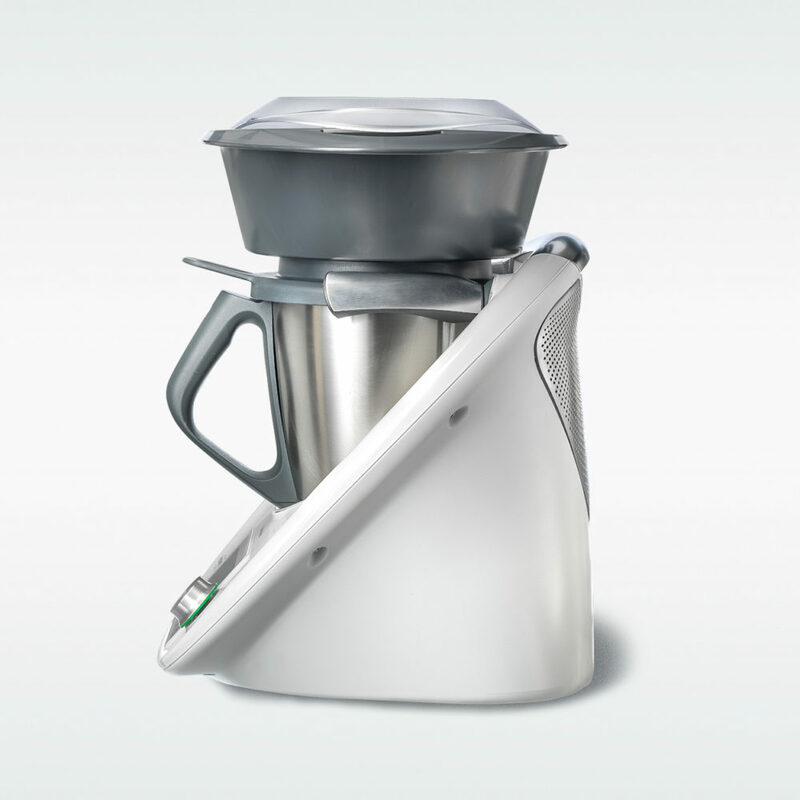 Thermomix ® is available direct from one of our Thermomix ® Advisors. It is not available online or in retail stores, but you can contact with us and request information. Our advisors will offer you a comprehensive demonstration of the unique functions of the Thermomix ® and after-sales customer service and ongoing support. 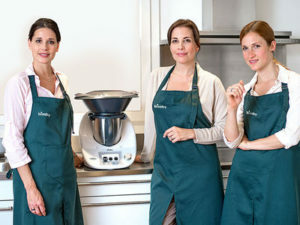 For more information on demonstrations and purchasing a Thermomix ®, please click on here.